LEARN HOW TO MAKE HOMEMADE CONDITIONER WITH ALL NATURAL PRODUCTS, SCENTED WITH ESSENTIAL OILS. GREAT FOR STRENGTHENING THICKENING, AND HEALTHY HAIR. 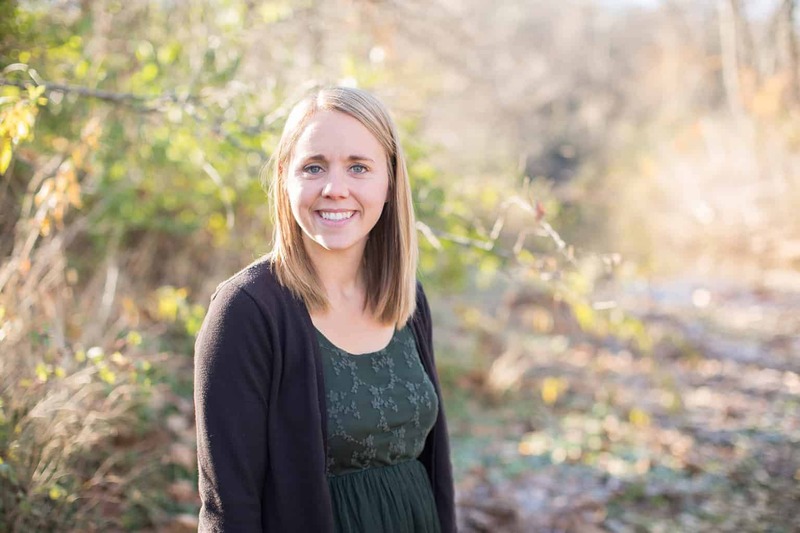 After sharing my DIY shampoo recipe I had several readers ask about conditioner. I have the hair type that doesn’t necessary need conditioner. My hair is pin straight and extremely fine. I don’t even need to brush it after showering, or really ever. My husband has the opposite thing going on. His hair is thick, course, and curly. And yes, all my kids got my hair! I was really praying for one head of curls, but apparently straight hair is dominant. He uses conditioner every time he showers and really needs it to tame and moisturize his hair. This simple homemade conditioner has amazing benefits for your hair and the best part, it is toxic free! In a double boiler melt the cocoa butter and coconut oil together. You can make your own double boiler by placing a glass bowl over a pot of boiling water. After the cocoa butter and coconut oil are melted together remove from the heat. 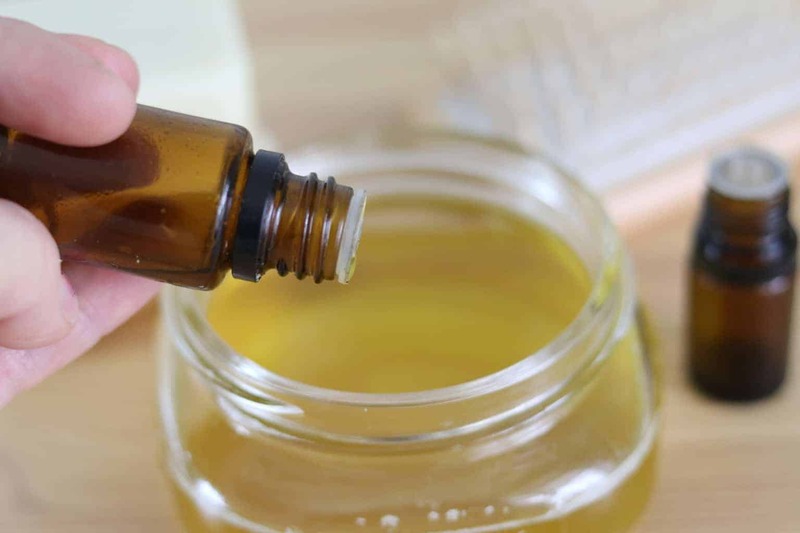 Let cool for 5 minutes and then add in the jojoba oil, aloe vera, and essential oils. Stir well and pour into storage container. After washing hair with shampoo, add about a teaspoon of the conditioner to the scalp and massage in. Allow the mixture to sit on the hair for 2-3 minutes and then rinse out. 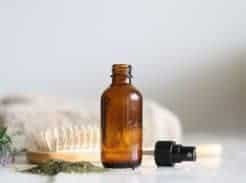 Several essential oils can be used to promote a healthy scalp and hair. 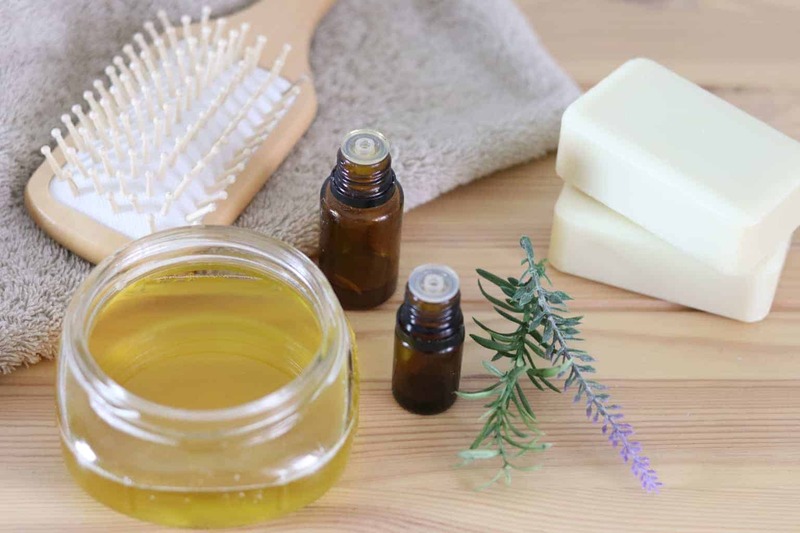 Essential oils can be used to strengthen, thicken, and lengthen hair. 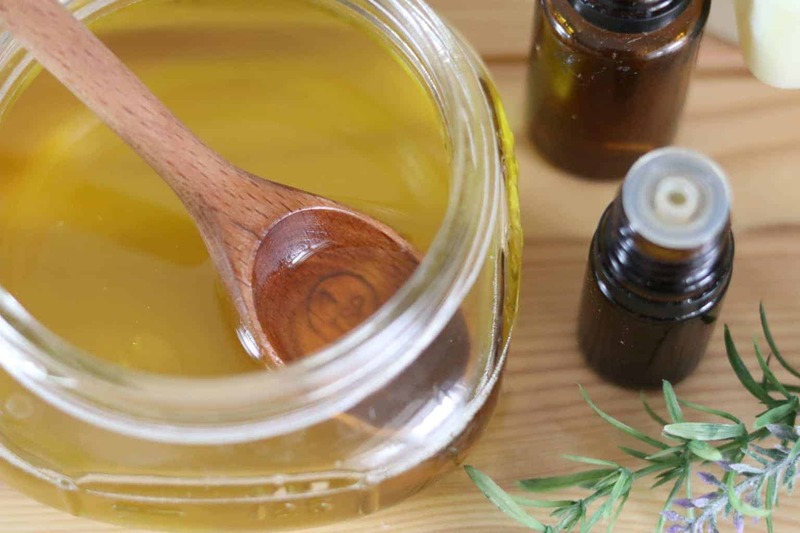 Rosemary essential oil is the top oil for hair growth and thickness. It helps to treat dry hair, as well as overly oily hair, and can help prevent split ends. Studies have shown that lavender produces more hair follicles to help thicken and strengthen hair. Lavender has a beautiful floral smell that can promote calmness and reduce stress; stress can be the biggest reason for hair loss. This essential oil is known for the cooling effect it has on the skin when used topically and for its refreshing minty scent. Peppermint is also great for the hair as it promotes hair growth and thickness. My personal favorite smelling oil of all time! Sandalwood can stimulate hair growth, help against dandruff, and promote a healthy scalp. Bergamot has been very successful at promoting hair growth when massaged into the scalp. With cleansing and purifying properties it is also effective at keeping the scalp healthy. This essential oil has a citrusy, yet woodies smell making it a perfect scent for men or women. 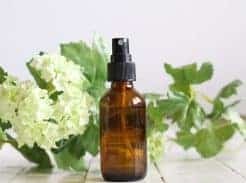 I make a bread oil with lemongrass that my husband loves, and he is pretty picky about having products with manly smells! 😉 Lemongrass is great for the hair and can help to strengthen and thicken. Adding clary sage to the conditioner will help with hair growth by strengthen the hair and preventing split ends. I love the refreshing and uplifting aroma of wild orange. Wild orange is amazing for supporting the mood, the immune system, and can benefit the hair. Melaleuca promotes a healthy, clean looking scalp. It can be used to help with a dry itchy scalp and protect against lice. Roman chamomile is a delicate essential oil that is sensitive enough to use on young children. It can help to soften the hair, while adding shine. I love using this oil on my kid’s hair. 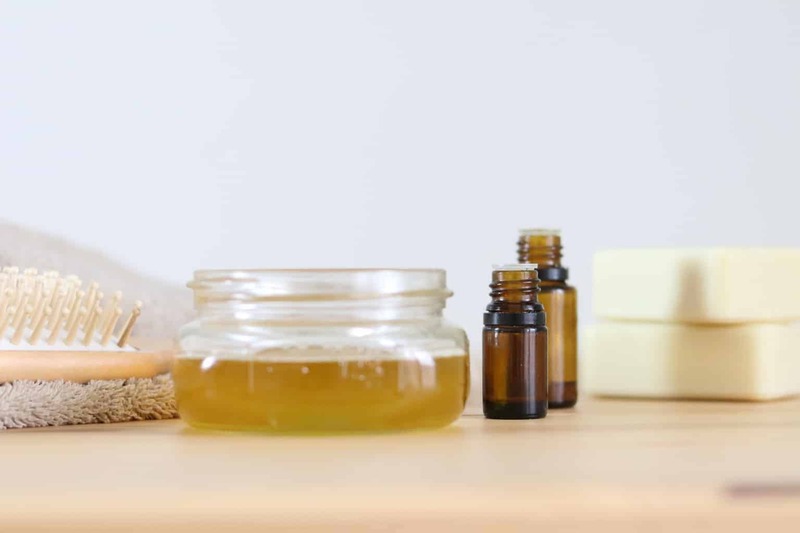 You may notice that I like to sneak this ingredient into almost all my DIY products, and that is probably why I am tempted to eat things like my homemade lip balm and body butter. This stuff is amazing for the skin, hair, and can be used to make delicious chocolates. Cocoa butter is extremely moisturizing for the skin and works well at conditioning the hair. It provides shine, protects against split ends, and softens hair. It is no secret that coconut oil can be used for basically everything and that it is very beneficial for you. It is a known superfood and found in many natural beauty products. Coconut oil is very beneficial to the hair and can add moisture, strengthen hair, and protect against split ends. Coconut oil has antibacterial properties making it great for protecting the scalp against infections and lice. It is also effective for nourishing the hair and removing build up. Jojoba oil is often used as a natural remedy for dandruff because of its mostirzing properties. Using jojoba can also prevent hair loss and help hair to thicken. If you have oily hair you can eliminate this from the conditioner and try adding in a few drops of lemon to reduce greasiness. Some people use plain aloe for a hair conditioner and it is very effective, especially as a hair conditioning treatment. You can apply aloe to the hair and allow it to soak for 2-4 hours or overnight and then rinse the hair in the morning to heal damaged hair. Aloe can reduce dandruff by repairing dead skin cells on the scalp and leave your hair fuller and shinier. 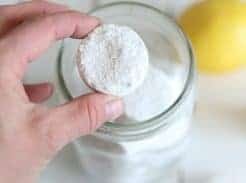 Have you tired homemade conditioner? How did it make your hair feel? What essential oils did you add? Share your stories with us in the comments below!